This was a movie I saw late in the summer of 1979. The subject is football but not so much the game as the business of the game. I’m not sure that I like it as well as I thought I did. Part of the reason is that the movie is sold as a comedy, and while there are several amusing bits, the majority of the film appears to be a criticism of the game. I’ll add that it was not a very focused criticism. 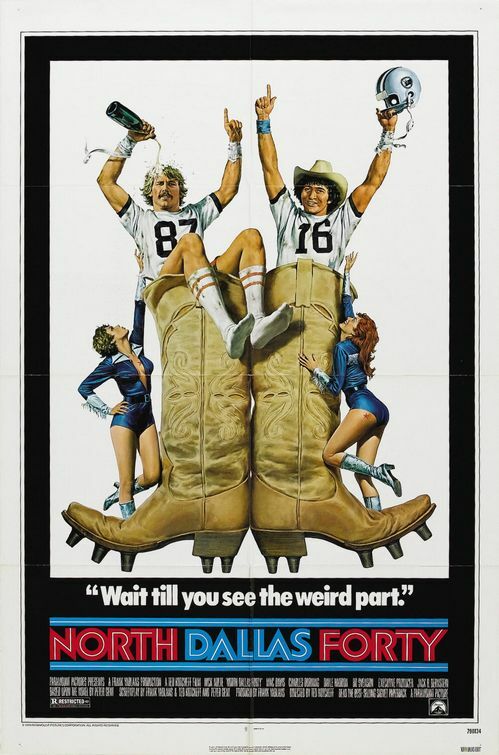 Nick Nolte and Mac Davis are the hot shot stars of the Dallas football team. They drink , smoke pot, and generally carouse with the other players on the team. For some reason Nick Nolte’s character thinks better of himself than this. He is supposed to be an outsider, because he does not toe the company line. It is not clear what the team wants from him that he sees as being untrue to himself. His closest friend on the team, the quarterback played by Mac Davis, pretty much does things the same way he does, and nobody seems to be upset about that. As far as you can see, Nolte’s character follows the directions of the coach and performs on the field. This movie is apparently based on a book that was a loose expose of the Dallas Cowboy organization. If Mac Davis is supposed to be a stand in for Dandy Don Meredith, then Roger Staubach is not the man he claimed to be, or he ought to sue. The episode in the film that contains the biggest laughs, focuses on a story involving the religious married rookie quarterback,being involved in a disgusting sexual peccadillo. The tag line for the poster about waiting for the Weird stuff comes from this story. The movie is two hours and it has 15 minutes, at best, worth of funny. What it does have going for it is a locker room view of the professional game. The supporting characters feel real, even the ones that engage in some outrageous stunts. The two offensive line men are slightly crazed and seem like exaggerations, but it never goes to the point of parody. On game day their ritual is one of the most real things in the movie. Another thing that is real, or at least feels real, is the way the players are manipulated by the coaches to get the most out of them. My guess is that this was true at the time the movie was being made. Here is the problem with the movie in a contemporary context. The players today have much greater power, the league does not treat the injuries of star players or others lightly. The mechanical approach that the coach takes in the movie, is a big part of the game today, but instead of the game suffering for it, the quality of play has improved. Maybe the guys in the old days were tougher but they were not faster, or stronger or more professional than the NFL players of today. If Nolte’s character took that damn cigarette out of his mouth occasionally, and took the workouts a bit more seriously, he would not need as many pills and shots as he takes in the movie. The character played by Bo Svenson is supposed to be hopped up on steroids, that would account for his rage and the sexual frustration he shows at the party. However, the word “steroid ” is never used, and all he gets are B-12 shots. Maybe we are supposed to see thru this, but since every other argument against the game is spelled out in big letters to get the message across, it seems strange that they pull their punches here. This movie wants to have it both ways. It wants us to root for the team, see the player perform, and then afterward, we are supposed to dismiss all of this as something childish. The girlfriend that Nolte’s character gets involved with is a good illustration of this. She is an outsider at the wild party, who holds the players in disdain (Justified in this scene but not others), she points out all the problems that her boyfriend has with his body, but appreciates the play he makes in the big game at the end. She is a plot device to allow Nolte to work off of and verbalize his criticism so we can hear it out loud.